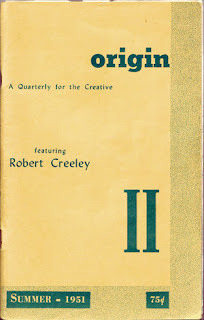 In 1951, in response to a planned but failed project by his friend Robert Creeley, Corman began the magazine, Origin, devoted, primarily, to one writer in each issue. Published, with various breaks, until the mid-1980s Origin featured the works of numerous American poets, including Creeley, Robert Duncan, Larry Eigner, Denise Levertov, William Bronk, Theodore Enslin, Charles Olson, Louis Zukofsky, Gary Synder, Lorine Niedecker, Wallace Stevens, William Carlos Williams, Paul Blackburn, and Frank Samperi—many of these writers later connected with or influenced by the Objectivist Poets or poets involved with Black Mountain College, although Corman’s own work eschewed a single poetic formulation. Origin also began publishing books that included works by Corman and others. Both the magazine and the press shifted locations with the editor’s own moves, beginning in Ashland, Massachusetts, moving to Kyoto, Japan, back to Boston, and returning to Japan again as Corman resettled. In 1975, Corman published an anthology of Origin publications, The Gist of Origin, 1951-1971: An Anthology, printed by Grossman publishers. Corman’s publications might be summarized as one of the longest lasting and significant enterprises of small press activities, having a large effect on American poetics in general. The Origin archive is housed at Fales Library at New York University.